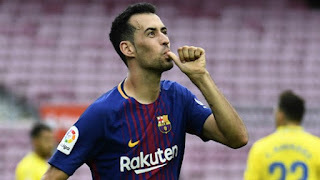 Manchester City manager Pep Guardiola is ready to raid former club Barcelona to sign midfielder Sergio Busquets, reports Don Balon. The 29-year-old has a €200 million release clause at Camp Nou, but Guardiola believes that a bid of €56m will be enough to convince Barca to sell him to the Premier League leaders. Busquets' contract runs until 2021, but Philippe Coutinho's imminent arrival in La Liga could pave the way for the Spain international to move to City.